Join the ninja Penguins on their quest to save the arctic from the vicious villains that want to enslave these little creatures. Click here to play! If you can help these flightless birds save the day you will be handsomely rewarded. Stick close to Sam the Samurai as this bird will lead you through the adventure. He is a substitute symbol and will replace most others (excludes scatters) to help you spin in even more winning combinations. If you can spin two to five Sam the Samurais across an active pay line you'll bring in up to 6000 times your line bet. Watch out for the walrus, as this evil villain needs to be stopped. Capture him two to five times across an active pay line and you'll get up to 2000 times your line bet. There are a few other symbols to help you in this adventure, including fish, squid nunchuks, and ninja stars. All of these symbols will payout well if you can spin three or more across an active pay line. You'll need to release the little helpless penguins from their icy prisons as you fight the good fight. 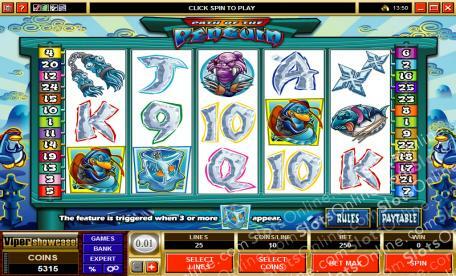 The penguins in ice act as scatters and will multiply your total bet if you can spin two or more anywhere on the board. If you spin three or more anywhere, you'll trigger a bonus feature that will see you collecting even more wins. Help the ninja penguins in their quest to rid the arctic of all the evil villains and you'll be handsomely rewarded! Sam the Samurai penguin is a wild. He will replace other symbols, excluding scatters, to help you bring in more wins. He will also pay out the top prize of 6000 times your line bet if you spin five across an active pay line. A bonus feature is triggered when three or more penguins on ice appear anywhere on the board. During this game you will get to choose from a selection of ice cubes to be broken open to reveal your prize. You can win free spins and bonus cash prizes.